This was a big trip. Nearly 7000 nautical miles in total, 11 months spent with the owners and their boat, 8 countries, hundreds of islands, lots of different cultures and food, lots of sailing ! My blog contains all the relevant information about this trip but i don’t expect everybody to go back and visit every entry so i will try and summarise it here. If there are any inparticular parts you might find interesting then you can always go check out the blog. Ok, where do we start with this one ? From my sailing courses i had attended i had found out about websites where boat owners look for crew and crew look for boat owners. To cut a long story short i joined such a site, saw an advert, replied, got talking and bingo – landed a position on a yacht as a crew member on a 6 month voyage from New Zealand to Singapore. Sounds easy doesn’t it ? Well not really, ain’t always this simple, i fell on my feet with this one ! I will write a seperate article about crewing on boats, finding places, paid or not paid, etc,etc. 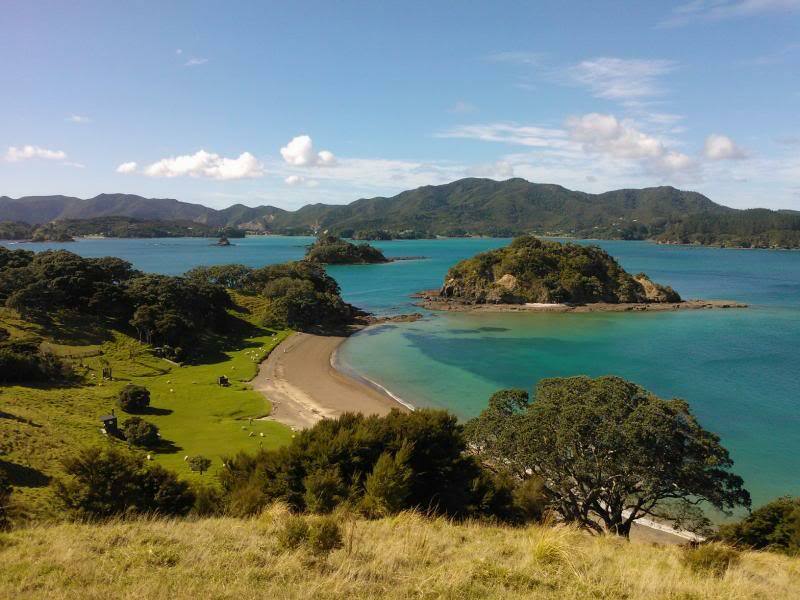 Anyhow, i joined the boat in Whangarei, New Zealand, in April 2013. The voyage would take us to New Caledonia, Vanuatu, Australia, Indonesia and Singapore and last approximately 6 months and 4000 nautical miles. What actually happened was a trip from Whangarei New Zealand, to New Caledonia, Vanuatu, Papua New Guinea, Indonesia, Singapore, Malaysia and Thailand. It lasted 11 months and approximately 6500 nautical miles. I visited some fantastic places, met some interesting people, eat some great food, saw some glorious deserted islands and beaches, had some great beer, mixed with the sailing community, caught some fish, had nothing stolen, spent some money, remained mostly healthy and generally enjoyed myself !! Left New Zealand 8/5/2013 sailed to Noumea, New Caledonia. Total milage 963NM and 8 days at sea. Had a few days in Noumea visited Port We, Lifou, Loyalty islands. Left New Caledonia 25/5/2013 sailed to Port Villa, Efate, Vanuatu. 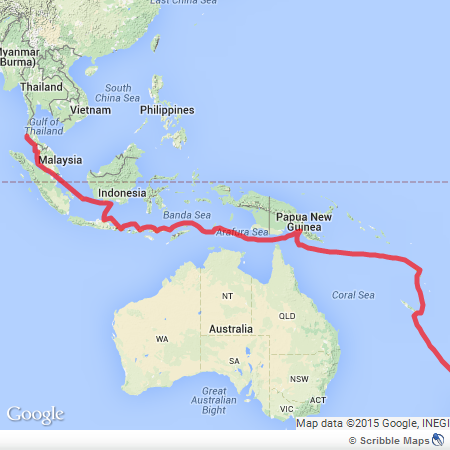 A day and night sail – only 226NM. Sailed to Epi, Malekula and Espiritu Santo within Vanuatu. Left Vanuatu 20/6/2013 sailed to Port Moresby, Papua New Guinea. Total mileage 1268NM and 11 days at sea. Left Port Moresby, PNG, 16/7/2013 sailed to Saumlaki, Ambon, Indonesia. Total mileage 1014NM and 8 days at sea. Left Saumlaki, after we had joined Sail Indonesia, to Alors, then Flores, Lombok, Bali, Java, Borneo and then Danga Bay, Malaysia opposite Singapore. Total mileage 2374NM. 3 months spent in Indonesia. Left Danga Bay, after we had joined Sail Malaysia, to travel to Port Dickson, Pangkor, Penang and Langkawi, all within Malaysia. Total mileage 461NM. Left Langkawi sailed to Phuket, Thailand. Total mileage 135NM. A day and night sail. Left the boat in Phuket, Thailand, to start travelling overland. Joined the boat end of April 2013, left the boat mid March 2014. Time Spent on board 11 months. Please read the blog for any part of the trip you might be interested in – it really is rather good ! !